It's official: The largest pumpkin ever grown in Oregon was recorded Saturday afternoon at Bauman's Farm & Garden during its annual Harvest Festival and Giant Pumpkin Weigh Off. 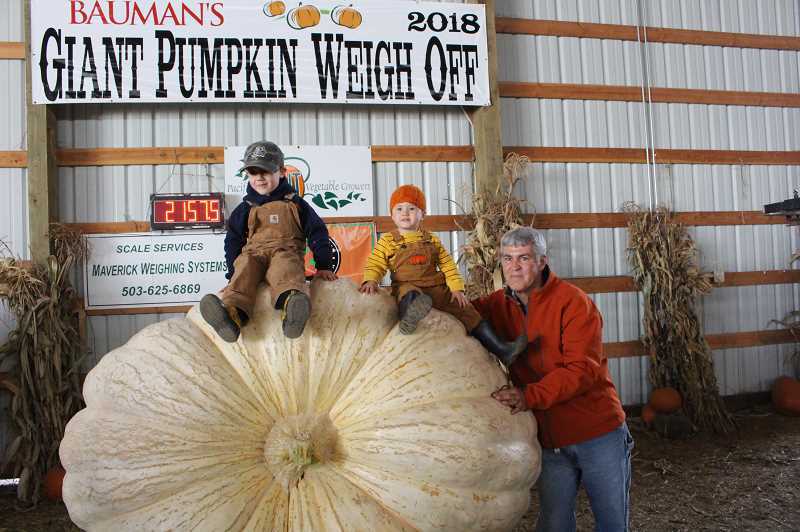 Steve Daletas of Pleasant Hill, was able to grow a pumpkin that registered 2157.5 pounds, breaking the previous Oregon record. Growers from all over the region visit Bauman Farms for the event to vie for cash, prizes and recognition. Daletas has held the Oregon record before and numerous other championships over the years, and he shattered that record cleanly on Saturday. The weight was recorded and verified by the Pacific Giant Vegetable Growers Association. The day's festivities, all part of Bauman's Harvest Festival, also featured the Giant Pumpkin Drop, during which a pumpkin weighing more than 1,000 pounds was dropped from the sky into a pool. For more information on the Harvest Festival, visit http://www.BaumansHF.com.